Looking for more of a challenge with Sudoku puzzles? 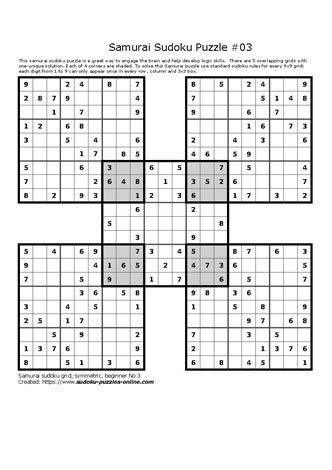 Try this samurai Sudoku puzzle which is a 5 Sudoku grid-interlaced puzzle. There are different challenge levels for these brain teasers and this puzzle is at the beginner level. Use logic and basic Sudoku rules to solve this challenging puzzle. There is one unique solution.